	William S. Richardson School of Law, University of Hawaii, J.D. HB801 RELATING TO DRIVER'S LICENSING. HB802 RELATING TO DOMESTIC VIOLENCE. HB803 RELATING TO SCHOOL BASED HEALTH. HB804 RELATING TO VEHICLE REGISTRATION. HB805 PROPOSING AN AMENDMENT TO ARTICLE I OF THE CONSTITUTION OF THE STATE OF HAWAII. HB1205 RELATING TO SOLAR ENERGY DEVICES. HB1207 RELATING TO CAPITAL IMPROVEMENT PROJECTS FOR THE BENEFIT OF THE TWENTY-FOURTH REPRESENTATIVE DISTRICT. HB1441 RELATING TO MEDICAL CANNABIS PRODUCTS. HB1446 RELATING TO THE MAKIKI PUBLIC LIBRARY. HCR86 URGING THE DEPARTMENT OF TRANSPORTATION TO STUDY THE FEASIBILITY OF EXTENDING EXPIRATION DATES FOR THE DRIVER'S LICENSES OF NON-CITIZEN RESIDENTS LEGALLY PRESENT IN THE STATE UNDER THE COMPACT OF FREE ASSOCIATION. HCR111 REQUESTING THAT THE OFFICE OF INFORMATION PRACTICES CONDUCT AN ALTERNATIVE APPEAL RESOLUTION PILOT PROJECT. HCR112 AUTHORIZING THE AMENDMENT OF A LEASE COVERING A PORTION OF STATE SUBMERGED LANDS AT PIERS 24 TO 26, IDENTIFIED AS "LOT 12", IN HONOLULU HARBOR, OAHU, FOR PACIFIC SHIPYARDS INTERNATIONAL. HCR114 REQUESTING THE DEPARTMENT OF HEALTH, DEPARTMENT OF HUMAN SERVICES, AND DEPARTMENT OF EDUCATION TO CONVENE AN INTERDEPARTMENTAL WORKING GROUP TO ADDRESS THE LACK OF CONSOLIDATED, CONSISTENT HEALTH SCREENING PROGRAMS IN PUBLIC SCHOOLS FOR CHILDREN IN THE STATE. HR83 URGING THE DEPARTMENT OF TRANSPORTATION TO STUDY THE FEASIBILITY OF EXTENDING EXPIRATION DATES FOR THE DRIVER'S LICENSES OF NON-CITIZEN RESIDENTS LEGALLY PRESENT IN THE STATE UNDER THE COMPACT OF FREE ASSOCIATION. HR104 REQUESTING THAT THE OFFICE OF INFORMATION PRACTICES CONDUCT AN ALTERNATIVE APPEAL RESOLUTION PILOT PROJECT. HR207 CONGRATULATING THE MARYKNOLL SCHOOL BOYS VARSITY I BASKETBALL TEAM ON WINNING THE DIVISION I STATE CHAMPIONSHIP. Thank you for visiting. It is truly an honor to represent the Makiki, Tantalus, McCully, and Papakolea communities. I hope you will consider this website as a useful community resource. In addition to this website, I also distribute an e-newsletter to help you stay informed about important legislation and news from our community. If you would like to subscribe to this e-newsletter, please e-mail me at repbelatti@capitol.hawaii.gov. HACBED, Rep. Belatti and other State Legislators host Free Tax Service at State Capitol on Saturday, February 4, 2012 from 9:00 am - 2:00 pm. Appointments & Walk-ins welcome (last walk in at 1:00 pm) To schedule an appointment, please call 381-0881. Summer's here and the May/June 2011 District 25 News is packed with information. You can read about some of the Legislature's "unfinished business" and how I'll be focusing on early education efforts and working on a new "Makiki Summer Reading Project" during the interim. Also read my update on the legislative and gubernatorial efforts to address homelessness in the state of Hawaii, starting with the Governor's announcement in May to implement his 90-day action plan. As always, please feel free to contact me via email or at 586-9425 at any time. I'm also Twitter friendly, and can be reached through @repbelatti. What is the "Hawaii Clean Energy Initiative?" What is the PUC? 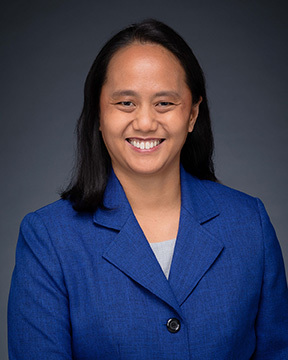 Learn the answers to these questions and more at our next Makiki Town Hall meeting featuring newly appointed PUC Chair, Hermina Morita. Special guests also include Acting Chair of the House Energy & Environmental Protection Committee Denny Coffman; Sopogy, Inc. CEO and President, Darren Kimura; and our very own Governor Neil Abercrombie. This Earth Day 2011 event is sponsored by Representative Della Au Belatti. For more information, please call 586-9425. In this belated March issue of District 25 News, you'll find short descriptions of several House bills that made it pass the all important crossover deadline in the 2011 Legislative Session. And with the tragic events of the recent Japan earthquake and tsunami, we identify the tsunami inundation zone closest to Makiki and the designated Refuge Area located within our district, and offer you a variety of ways to help our global neighbors in need. Gather up your neighbors for the next Makiki Neighborhood Security Watch (NSW) meeting. HPD will help NSW groups with basic community policing skills. 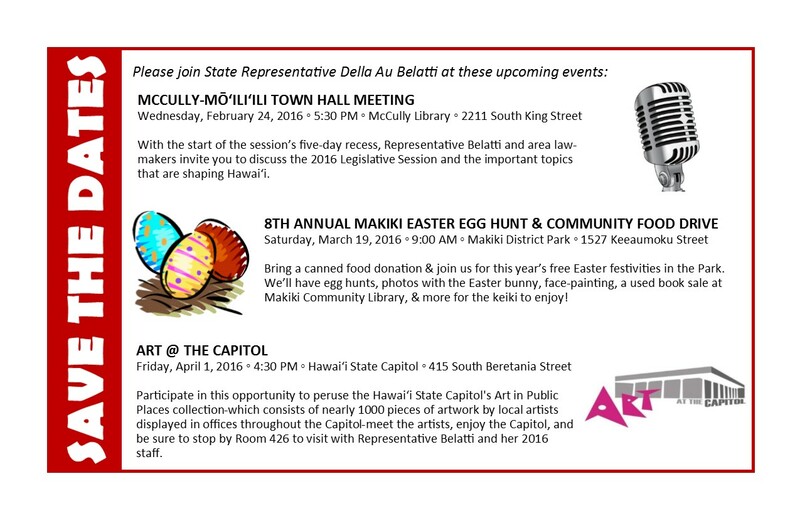 Call 586-9425 or email repbelatti@capitol.hawaii.gov for more information. 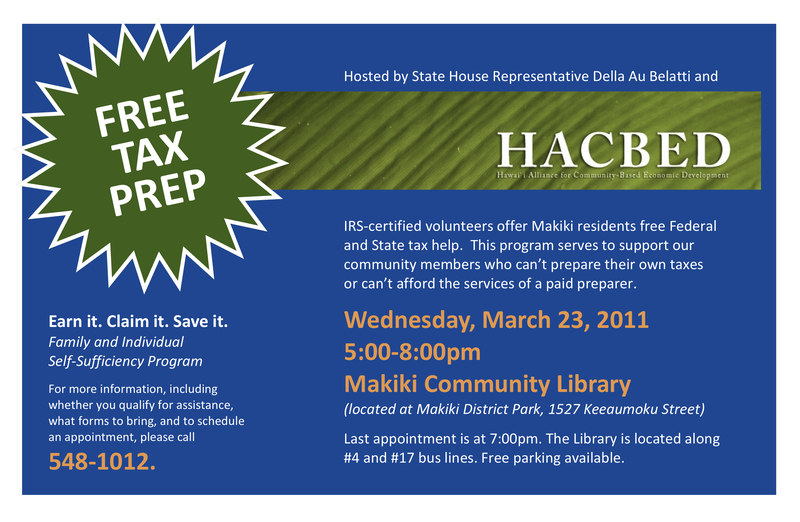 Rep. Belatti Brings Free Tax Service to Makiki Wednesday, March 23, 2011 5:00 pm - 8:00 pm, by appointment only. To schedule an appointment, please call 548-1012. Join Representative Belatti, Friends of the Makiki Community Library (MCL) and Hui O Makiki clean up Makiki District Park and MCL. Volunteers are needed to help paint over graffiti and perform various clean up projects. If you or your organization would like to help, contact Jonalyn Uehara at 586-9425 or belatti2@capitol.hawaii.gov for more information. The project team for the construction of the new Safeway will be available to answer any questions at this meeting. For more information, please call Puanani at 543-3582. A great opportunity for the community to meet their neighbor Catholic Charities, and to discuss any concerns about noise and parking. Members of Makiki's elected legislative delegation will also be there. The meeting will be held Monday, 12/13 at 5:30pm, Clarence T.C. Ching Campus (1822 Keeaumoku Street at Nehoa). For more information, contact Catholic Charities at 527-4849. Join Representative Belatti and Council Member-elect Tulsi Gabbard Tamayo for a pre-Legislative Session Town Hall Meeting. 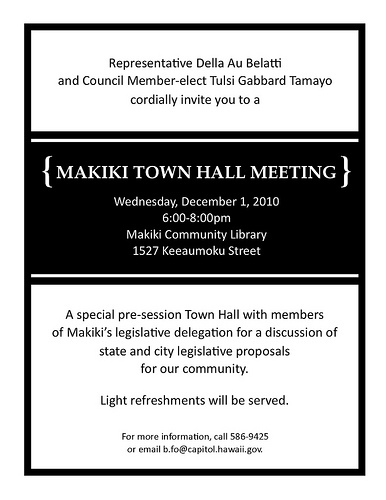 State Representative Della Au Belatti and Council Member Tulsi Gabbard Tamayo will co-host a Town Hall meeting to discuss new ideas for bills before the start of the 2011 legislative session. The public is invited to attend with questions and comments for the lawmakers and to discuss significant issues to the community. WHEN: Wednesday, December 1, 2010 6:00 p.m. WHERE: Makiki Community Library 1527 Keeaumoku Street at Wilder Avenue (ample parking at Makiki District Park) While email and phone calls are an important way to communicate with elected state and city delegations, meeting and talking in person is one of the best ways for legislators to keep informed about issues that affect the neighborhood.